Here’s an ideal accessory for your Nintendo Wii, the Nyko Charge Station Quad. Now you can keep all your Wiimotes charged with this quad charging station. 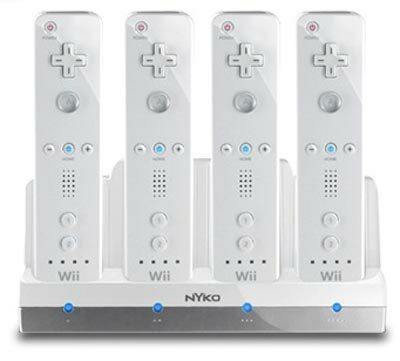 The Nyko Charge Station Quad comes with 4 NiMH batteries, and each one will provide up to 25 hours of playtime on your Nintendo Wii. It also comes with 4 different custom coloured battery covers, which let you charge your Wiimote batteries whilst they are still in the Wiimote. The Nyko Charge Station Quad will retail for $49.99.